Blow Hard: best control ever? This may possibly be the most amazing control in the history of controls. Found by a friend on a hotel air conditioner. There are clearly only two options, blow hard or blow harder. Otherwise, just stop. Of course, the usual method for designing an air speed control is a range from Low to High, communicated either with words or a graphic spectrum, plus Off. Also, “more” is typically clockwise to the right and “less” is ccw to the left. But this control shows the danger when you try to use colloquial English terms for interface controls. Great theory, but proceed with caution. June 2, 2008 | Permalink | Comment? WebVisions wrapped up a week ago and I’m still feeling it. I love this event every year. One, because it’s in Portland so attending it is easy. But really, two, because it attracts great topics and people to spend time with, exactly what you want in a conference. I will always have a soft spot for WebVisions because its founder Brad Smith took a chance on my weird topic History of the Button two years ago, which kicked off the blog, etc. So Brad, thanks for letting me talk again. On the second day, I spoke on the Language of Interaction, a topic that I’ve been evolving over the last three presentations. As usual, I tweaked the presentation up until the final morning, but overall I believe it went well. Talked for an hour and questions for 15 minutes. Dang that’s a long time. When the audio podcast becomes available, I’ll splice it together with the slides. You can view the slides after the jump. April 29, 2008 | Permalink | Comment? For my talk at Interaction08, I published a paper to accompany the talk, and then hosted it at a separate site. I’d like to bring it into here, continuing the theme of bringing everything under one roof. Inside are the video and slides of the talk. Enjoy! We are interaction designers during a time of rapid technological change, placing us in the incredible position of collectively creating and curating a new language, the language of interaction. The explosion of products with interfaces means that people have to continually adapt and learn new things. They will have to read each interface and look for clues, common visual elements that they’ve seen before. They’ll subconsciously look for a language that comprises words, sounds, colors, shapes, icons, motion, gestures, priorities, hierarchies and more. We are the custodians of this language, creating and curating it organically. We need to start seeing it everywhere and learn from each other as we define the future relationship between people and technology. April 27, 2008 | Permalink | Comment? Surprise! After a month of deliberating and a weekend of tweaking WordPress, I’ve changed History of the Button to a new blog name, “Push. Click. Touch.” New name, new server, new layout, expanded focus. It’s “fun” to tweak WordPress, but now it’s time to get back to writing. So why would I do this? What compelled me to change the name of a blog that people surprisingly paid attention to? After all, switching is a branding nightmare. The “History of the Button” name is out there, just odd enough to throw people off guard and remember it. I see the danger. I’ve been around the tech block long enough to know that brand is a dangerous thing to toss aside. But it felt like I painted myself into a corner. The hyperfocus of History of the Button was both boon and bane. The tight lens allowed for some really interesting exploration. However, I never felt as if I could veer away from it. I couldn’t comment on experience design in general, react to the writing of others, because it didn’t fall under the scope of History of the Button. It’s the name of a project, not a platform. Of course, this is only my perception. If I wanted to comment on Andrew Hinton’s closing talk at the IA Summit, would anybody blink if it was published under the banner of History of the Button? I really doubt it, but it was still getting in my way. Time to rethink my mission here! Welcome to Push. Click. Touch. My goal here is to expand upon and evolve the focus of History of the Button, to think broader than how we got to where we are as a profession, but to also explore its context and think about its future. Interaction design and experience design in general are fascinating fields to work in right now, and will be for some time. I look forward to contributing to that. I’ve also collected here writings from my previous blog Fluxion, which was active from 2001-2004. For the first time, all my writings are under one roof, which feels good. Enjoy. Comment away. Let me know what you think, or if you spot any problems. Interaction08 ended a few days ago and I’m still recovering from the firehose of information, inspiration, community and general yay, not to mention the excess of fried food and meats and the dearth of sleep. This was no question the best professional conference I have ever attended. Seriously. The conference committee just simply nailed it, in their very first conference. And why? Because they designed a conference. They paid attention. They didn’t hold it in a hotel. Instead they chose Savannah College of Art and Design, a design school with a minor in interaction design. They actually served good food with a sense of presentation. They didn’t hand out a binder full of printed Powerpoints. They made people enjoy being there. February 12, 2008 | Permalink | Comment? You can find the slides of my Interaction08 presentation at my new side site, The Language of Interaction. When I get my hands on the audio, I’ll stitch them together for a slidecast. Also there is the text (and PDF) of the handout that I distributed with the talk. In all, it was an overwhelming experience. I had some serious nervous energy going right beforehand, but thanks to Chris Baum for small talking me beyond it. The previous presenter ran a little late, I had things to plug in and papers to hand out, and the room was absolutely packed. But it all came together, and people seemed to really enjoy it, so yay! February 7, 2008 | Permalink | Comment? Finally, after months of waiting, Interaction08 begins tomorrow. The first conference focusing strictly on interaction design and put together by the Interaction Design Association (IxDA). The lineup looks great, a lot of friends are attending, and the weather looks beautiful. All set for a wonderful weekend. And I’m proud to be speaking on Saturday. If you’ll be at the event, please stop to say hello if you can. If you can’t attend, consider attending next year if you practice interaction design. This first year looks awesome. Just imagine what a second year will be like! January 28, 2008 | Permalink | Comment? Yet more clues of seeing how the button was incorporated into the culture. Check out these lyrics from “Push de Button” from the Broadway musical “Jamaica,” by Harold Arlen and Yip Harburg. 1957. Sung by Lena Horne. Come banana shortcake and frozen goose. 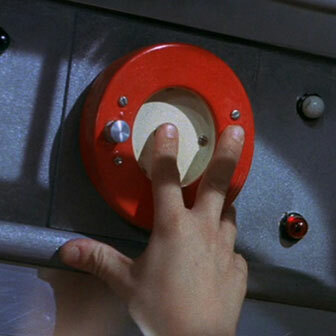 Push de button, push de button! What an isle! What an isle! Squeeze de tube and get Pepsodent smile! Turn de knob and get Muzak in jail! Now this isn’t very different from 1891′s You Press the Button, We Do the Rest. They are both songs about simultaneously marveling and lamenting the automation of daily life. But 66 years apart? Wouldn’t the button have been absorbed enough into the culture to not have to remark on it like this? Then again, if I saw a Frozen Goose button, I’d remark on that. January 15, 2008 | Permalink | Comment? Mix a smart kid that can hack, a clever remote control, real trains, and people are going to get hurt. A Polish teenager allegedly turned the tram system in the city of Lodz into his own personal train set, triggering chaos and derailing four vehicles in the process. Twelve people were injured in one of the incidents. The 14-year-old modified a TV remote control so that it could be used to change track points, The Telegraph reports. Local police said the youngster trespassed in tram depots to gather information needed to build the device. The teenager told police that he modified track setting for a prank. “He had converted the television control into a device capable of controlling all the junctions on the line and wrote in the pages of a school exercise book where the best junctions were to move trams around and what signals to change. “He treated it like any other schoolboy might a giant train set, but it was lucky nobody was killed. Four trams were derailed, and others had to make emergency stops that left passengers hurt. He clearly did not think about the consequences of his actions,” Micor added.